Re-issued last month by Superior Viaduct, which means this one is fresh off the presses and probably still hot to the touch(! 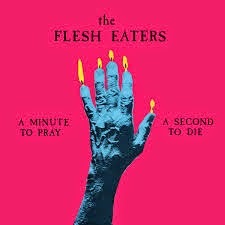 ), "A Minute To Pray A Second To Die" is the second studio album from California's legendary (experimental) punk rock band The Flesh Eaters. The product of Slash magazine writer/punk poet Chris D.(aka Chris Desjardins) this oft-times macabre/downright moody band, which was fittingly enough named after a cult horror film from the sixties, was formed in L.A. in 1977 before making it's official debut one year later with the 7-inch EP "Flesh Eaters" (aka Disintegration Nation). Three years later the punk "group" issued it's first full-length album, "No Questions Asked", and with it's dark, near-death rock take on garage rock and roll the stage was set for The Flesh Eaters (with it's goth rock mentality) to do something truly magical. Cue 1981's "A Minute To Pray A Second". More experimental and (in a way) breath-taking then "No Questions Asked" (an album that is also consider to landmark achievement in the field of punk rock) The Flesh Eater's (bizarrely beautiful) second full-length album benefited from having a star-studded backing band featuring a real who's who from the then ever-expanding L.A. punk scene. Besides having Chris D. on lead vocals/shrieks and maracas the one-time line-up included Dave Alvin (Blasters) on guitar, John Doe (X) on bass, Steve Berlin (Los Lobos) on sax, Bill Batemen (Blasters) on drums and DJ Bonebrake (X) on maracas, snare and marimbas. With it's darker hues and morbid, horror-themed lyrics the ghoulish "A Minute To Pray A Second To Die" had the impact of a speeding hearse slamming straight into punk's underground rock scene and (influentially) it would go on to inspire bands for years and years to come! By bringing together roots rock, country, rockabilly, goth rock, jazzy garage rock, death rock and the blues the album took a stab at what punk rock was supposed to sound like and turned it into something radically different and gloriously original. Much like The Gun Club this L.A. band marched to it's own beat as evident by the oddball nature of this landmark recording. As a re-issue it sounds as wonderfully madcap as ever making it all the more deserving of a spot in everyone's essential punk rock collection!